More bad news for property claims. Property insurance rates will increase significantly in 2013. The National Climatic Data Center has issued preliminary year-end statistics for the worst of U.S. weather in 2012 – the so-called “billion-dollar list” – and even without the final tallies filled in, the picture is not pretty. At least 11 weather events are known to have caused more than $1 billion in economic losses last year. They also killed at least 349 people, a figure that should be taken as a minimum because of the way we count weather-induced mortality. And though the year saw fewer big disasters than 2011, which had 14, the dollar losses were much larger. Some of the big hits in 2012 were sudden, like the tornadoes that killed 41 people in the Ohio River valley and southeastern U.S. on March 2 and 3. Some were vast, like Hurricane Sandy in the northeast and the derecho event that rolled over an even larger area for four days in late June and early July. And some were chronic, like the drought that has hung over half the country all year long, with associated extreme heat in the summer months that caused more than 100 clear-cut fatalities (plus uncounted other deaths that resulted from “heat stress” but couldn’t be linked to a particular scorching wave). The NCDC, which is part of the National Oceanic and Atmospheric Administration, won’t post its dollar estimates for the 11 events until mid-year. It likes to be precise in these matters and the vast impacts of Hurricane Sandy and the drought, in particular, are still being calculated. • Yearlong drought and extreme heat across more than half the United States, from California north to Idaho and the Dakotas and east to Indiana and Illinois. At least 123 deaths directly attributable to heatwaves and unestimated others occuring statistically as “excess mortality due to heat stress.” Losses exceeding $35 billion, primarily in crop failures. • Western wildfires from June through November, which “burned over 9.1 million acres across the U.S. … the second-highest annual total since the year 2000, only exceeded by 2006 when 9.4 million acres burned.” Eight deaths and damage adding to $905 million in an incomplete tally. • Hurricane Sandy over the northeastern Atlantic coast and inland, October 30-31; 131 dead and losses estimated at $62 billion. • Hurricane Isaac over Louisiana and the Gulf Coast, August 26-31; 9 dead and losses of $2 billion. • Derecho event of high winds and severe storms in a swath from Illinois to a mid-Atlantic zone stretching from New Jersey to South Carolina; 28 deaths and at least $3.75 billion in losses. • Tornadoes and severe thunderstorms in Texas, New Mexico and Colorado, June 6-12; no attributed deaths and at least $1.75 billion in losses, including $1 billion just from hail damage in Colorado. • Tornadoes and severe thunderstorms across the southern Plains, Midwest and northeastern U.S., including Minnesota, May 25-30; no attributed deaths and at least $2.5 billion in losses. • Tornadoes and severe thunderstorms from Texas and Oklahoma across the southern plains to Indiana and Kentucky, April 28-May 1; 1 attributed death and $4 billion in losses. • Tornadoes and severe thunderstorms in Oklahoma, Kansas, Nebraska and Iowa, April 13-14; 6 dead and $1.75 billion in losses. • Tornadoes and severe thunderstorms in a Texas region centered on Dallas-Fort Worth, April 2-3; no attributed deaths and $1.3 billion in losses. • Tornadoes from the Ohio River Valley south to Alabama and Georgia, March 2-3; 42 deaths and $4 billion in losses. 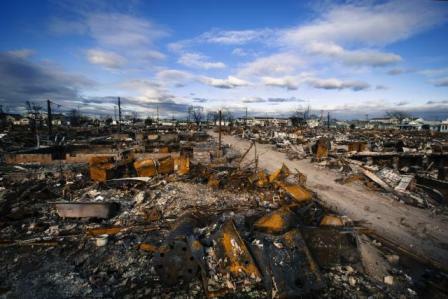 Hurricane Sandy, Oct. 29, $62 billion in losses and 131 dead. In fact, last year’s numbers would rank it as the second-worst year since NCDC started keeping the billion-dollar list in 1980. Only 2005 – the year of Hurricanes Katrina, Wilma, Rita and Dennis – produced a larger tally (some $187 billion in inflation-adjusted, 2012 dollars, and just over 2,000 deaths). I can’t point to statistics for this observation, but 2012 seemed notable to me for the rising willingness of weather and climate experts to abandon the standard disclaimer that no single event can be traced to climate change and say publicly that, yes, people, these new patterns are in fact what global warming looks like up close. But the severity of last year’s outbreaks still made 2012 a pretty bad year for tornadolosses, whether measured in dollars or lives, if you hold it up against 32 years of NCDC billion-dollar lists (they can be read here). You can see a lot of volatility in extreme weather over these decades but you can see a pattern, too. Through the ’80s and ’90s, a typical year had two or three billion-dollar hits, and very few had five or more. The losses typically added up to less than $20 million a year – and often less than $10 million (remember, we’re talking 2012 dollars across the board – this isn’t about casualty losses pumped up by inflation). But by the mid-2000s, years that would have been standouts in earlier decades had become the new norm. In its September issue, for a feature package called “Weather Gone Wild,” National Geographic drew on the NCDC data to calculate that billion-dollar events had become twice as frequent since 1996 as in the preceeding 15 years. Against that background, 2011 and 2012 look less like anomalies and more like continuations of a very bad trend.